Phishing (including spear phishing), persists as the #1 attack vector used by hackers today – and they continue to launch more sophisticated tactics to gain access to corporate networks and assets. But, did you know these alarming statistics? This webinar, based on PhishMe’s recently released Enterprise Phishing Susceptibility Report, will help you understand how complexity and context impact the phishing susceptibility of employees in an organization, and how a continuous security training program has proven to significantly change employee security behavior. 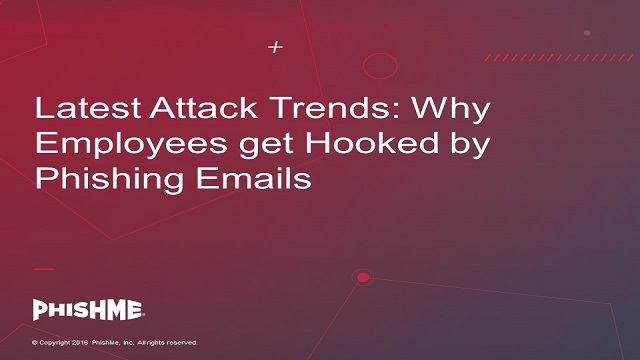 This data was collected from our study conducted with 400+ customers across 23 industries by sending over 8 million phishing-simulation emails to more than 3.5 million employees.